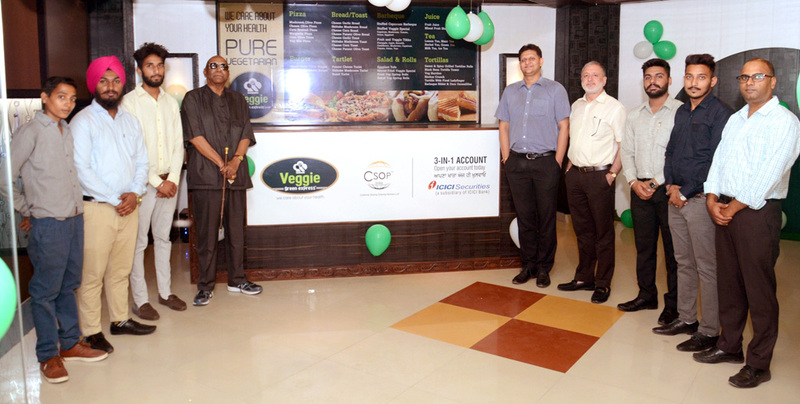 Veggie Green Express a unique and 100% pure vegetarian outlet started its operations at Desh Bhagat University, best private university in Punjab (2nd Rank, NIRF Ranking - MHRD Govt. of India). This is the first food outlet of the USA based company Equity Score in the country. The opening ceremony of the outlet was held in a very impressive style. The inauguration got huge response from foodies especially from the youth. Equity Score’s Professor Paul Douglas Katchings inaugurated the outlet. He informed that the first outlet has inaugurated at DBU. The mission of Veggie Green Express is to create more value for people through easier access to healthy vegetarian food and to keep our natural environment ‘green’. He told that the whole concept of Veggie Green is that it is completely run by the students, on rotation basis, who are associated with the Equity Score Program. A chain of 14,000 vegetarian restaurants will soon to be setup in India and Ghana, he added. Veggie Green Express™ is an Equity Score company. Its operational headquarters will be located in Chandigarh, India and Accra (Ghana), added the Equity Score representative. Dr. Zora Singh (Chancellor, DBU) graced the occasion as Chief Guest and wished all the best to the entire team of Veggie Green and hoped it will become the first choice of Veggie food lovers in a very short time. Veggie Green Express Team Leader Amarinder Singh (B. Tech-CE) disclosed that Veggie Green Express has a mission to serve healthy, fresh and vegetarian food to all at affordable prices. He insisted that at our outlet we will serve 100% vegetarian food. Also, we will not sell any beverages like carbonated cold drinks of any brands rather we are serving 100% natural and fresh juices made up of fruit and vegetables, to our customers. Team members of Veggie Green Lakhwinderjeet Singh (B.Tech-CE) and Virender Kumar (CSE) are the students who have been offered Package of 2 Crores by the Equity Score. The company has admitted them in to its new venture too. Other member of the team is Mahima (AE).